As the wealthy flee to gated communities like this, the center of the city becomes a battleground over the meaning of urban space. Cairo, at the moment of the revolution, was in the middle of an ongoing “space war” over the heart of the city. 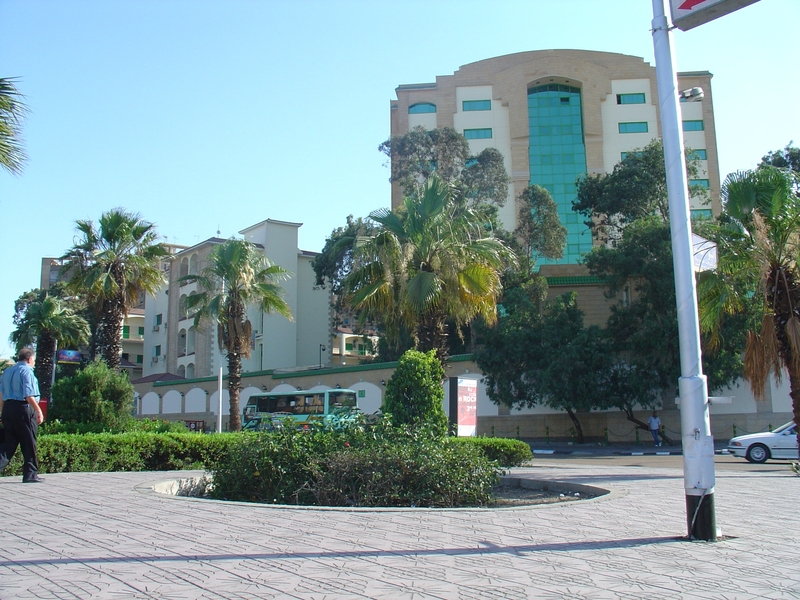 The rich have long been moving to gated communities on the outskirts of Cairo, while the amount of unplanned “slum” housing has expanded exponentially. The heart of the city–including the spaces around Tahrir Square–is slowly being abandoned by its traditional inhabitants (government office buildings and the American University in Cairo) and turned over to international developers who are creating commercial properties. That’s the picture painted by my former colleague Mona Abaza in an article in the latest issue of Urban Studies. The article, “Cairo’s Downtown Imagined : Dubaisation or Nostalgia?” is a fin-de-siecle piece, having been initially submitted in February 2010, then revised and fianlly accepted in January 2011, just as the uprising transformed everything. More recently – in early January 2011 – the ‘space wars’ of Cairo took a new and more fundamental turn. The “January revolution” represented an escalation of political protest led by the younger internet and facebook generation of Egyptian protesters. Tahrir Square (The Liberation Square), the vital heart of the centre of modern Cairo, the entrance square to the belle époque city, witnessed during January one of the most fascinating space struggles between those intent on maintaining the Mubarak regime and the multiple streams and classes of protesters, which reached over two million on the day of the “march of the million”. Tahrir Square witnessed a massacre perpetrated by the supporters of the regime on the second of February. It witnessed equally the encircling army tanks as check points, as well as artistic innovation, endless ironic slogans, jokes, performances of singers and poets and film directors, tents and campers, women and children squatting and what not and last but not least, opposition leaders and government officials who desperately wanted to contain the movement. If these space wars were to represent more than the contestation of the city – posing a challenge to the state itself – the future (at least at the time of writing) is uncertain. The essay has all the trademarks of Abaza’s style: insightful analysis expressed in clear, quick-moving prose, but without a great deal of substantive data, whether statistical, ethnographic or other, which one might use to affirm or reject the argument. The journal frames it a “critical commentary” rather than an article because the reader has to come to their own judgment as to whether the arguments hold up. Personally, I think she’s spot on, as usual. ← Egyptian State Media Changes Structural or Cosmetic?